“A cloud does not know why it moves in just such a direction and at such a speed…It feels an impulsion…this is the place to go now. But the sky knows the reasons and the patterns behind all clouds, and you will know, too, when you lift yourself high enough to see beyond horizons.” Richard Bach. 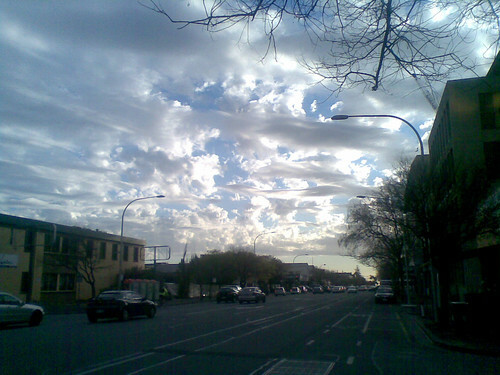 I often walk around looking up at the sky and this sky as I left work tonight caught my eye – the clouds looked gorgeous. I’ve always wanted to fly and if I could fly I would fly up in amongst those clouds. But I can only do that in my dreams and my dreams of flying are no long as frequent as they used to be in my childhood. Does that mean I’m more grounded now, or more grown up? I don’t know.